I have always wanted to see the wilds of Alaska from the seat of a motorcycle. The rugged mountains, the arctic tundra, and wide open vistas call to me, beckoning me to experience an adventure ride in a place of raw unfiltered nature. There was always some self-imposed road block, not enough money, not enough time, not enough holidays, blah blah blah, I never made it happen. Call it serendipity or karma, I knew the planets had aligned when my friend Neale Bayly outlined a plan to finish his journey to Alaska. I needed to know more, to be involved somehow, to finally make my own Alaska adventure a reality. 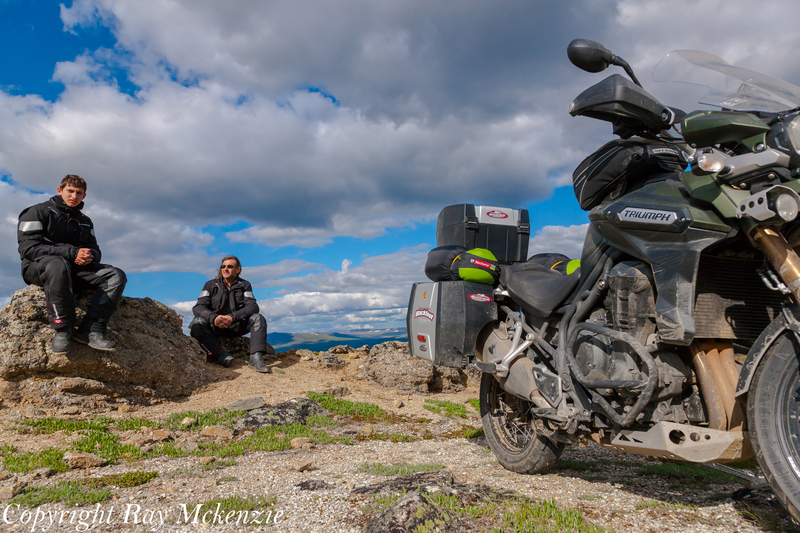 Always the story teller, I was captivated as Neale described his mid-1980s journey to reach the Arctic Circle north of Fairbanks, Alaska on an old Honda 550 Four. I could not help but feel excitement as he explained how weather, mechanical issues and fuel had prevented him from realizing his dream of crossing the Arctic Circle, and his plan was to finally complete that journey! There was such an underlying current of emotion in Neale’s voice, the passion in his dedication to finish the journey, to share it with his son Patrick, to be completely immersed in a true adventure away from the electronic umbilical cord that is typical in the southern 48 states. I was extremely grateful that he wanted this wild Canadian to experience the adventure with him. I was all in! 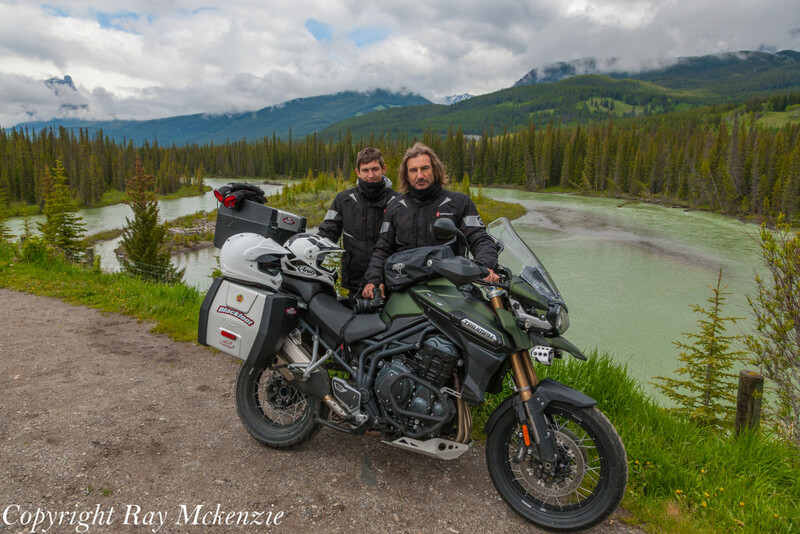 Neale and I hashed out plans for the trip which included picking up two new 2014 Triumph Tiger Adventure motorcycles, the 1200EX and the 800EX which were waiting for us at Blackfoot Motosports in Calgary where we would begin our journey. Pat Chambers one of the owners of Blackfoot assisted the adventure by having the motorcycles prepared for what would be an 8000+ km ride. Neale and I would not have time to break the machines in, or have service work done, so Pat made sure all the details were covered. Thanks Pat! A little more than a month later I was at the Calgary airport waiting for Neale and Patrick. During the wait, my thoughts drifted to my own sons who were now successful men and the missed adventures I should have shared with them. I cringed as I remembered the excuses I used to not venture out on with them, my excuses now a list of regrets. I so wanted to turn the clock back myself, to revisit the past and make things right, but time is unforgiving and I reflected on how to make positive changes in my life to best utilize my time on this earth. In the moment, I now had the chance to help my friend Neale finish a chapter from his past with his own son along to share the adventure, and truly a worthy venture. Bored with staring at the airport arrivals sign, I listened intently to the conversations of those around me which truly helped focus my resolve. People chatted about shopping, clothes, new trucks, late aircraft, trips to Las Vegas, and money, while I daydreamed of the coming journey in the saddle of a Triumph Adventure motorcycle. I wanted to be completely focused on the experience that would be Alaska. My moment of self-absorption was suddenly broken by the smiling face of my mate, Neale, and his 14 year old son Patrick! The snap back into reality was brought home crushingly when Neale, always exuberant, gave me the rib breaking man hug one would expect from an athlete. I laughed out loud, it was a surreal moment that made me incredibly happy to have my friend here, with our Alaskan adventure only a few short hours away. We picked up the Triumph Motorcycles at Blackfoot and spent the rest of the night packing and prepping them for the ride, adding a GPS, and heated gear plugins for Neale/Patrick’s Gerbring heated outfits. I could not contain my excitement, telling Neale, “We are off to Alaska!” He would look at me with a knowing smile, allowing me my overt moments of childlike bliss. Later, sleep was nearly impossible, the excitement of the coming adventure combined with my cat Bandit head booping and meowing at Neale, prevented all of us from getting the sleep we needed. With a good cup of Joe the next morning, we were right as rain, which was waiting for us outside along with dark ominous clouds. I said to Neale, “You cannot write scripts like this”, Torrential rains, thunder, lightning, and riding into the mountains with no support crew, let the adventure begin! 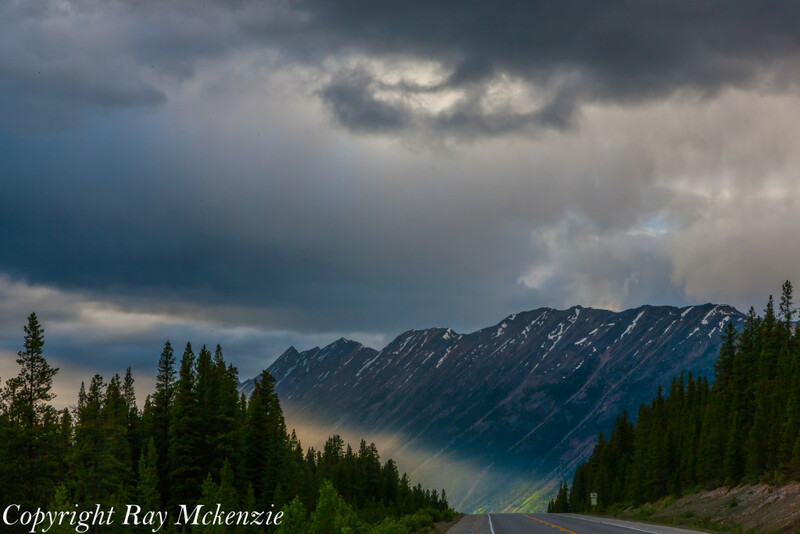 The stunning vistas that Banff and the Rocky Mountains offer could not be completely blocked by the rain and clouds, giving us glimpses of incredible beauty as we put the Triumph Adventure bikes in high gear and cruised northwest. It was only as we approached the Colombia Ice-fields that the rain let up and patches of blue glowed beautifully over the glacier encrusted mountains along Highway 93. Not surprisingly many of the lakes in the high mountains were still partially ice covered, which appealed to the photog in all of us. 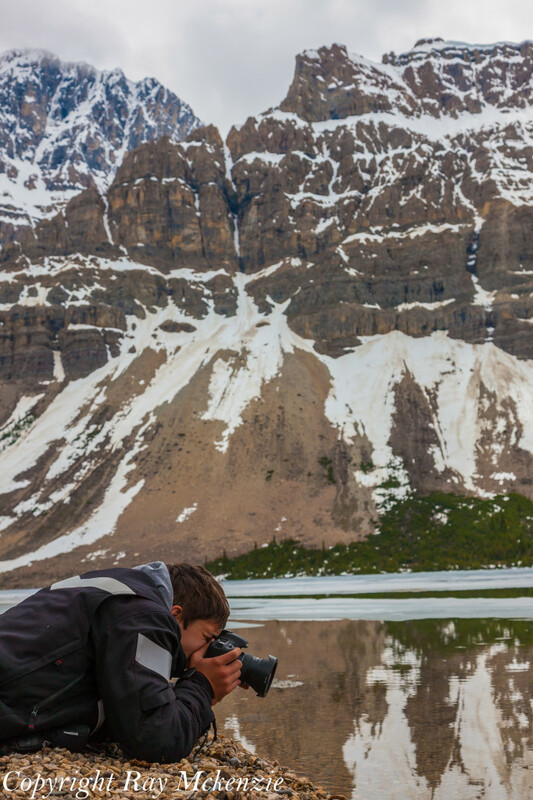 Soon Neale and Patrick were taking photographs from super low angles, capturing reflections of the mountains in ice and water, so different than the Smokie Mountains in their native North Carolina. 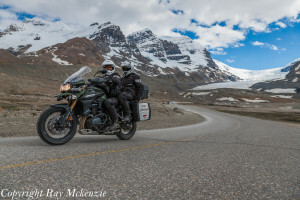 We lingered for quite some time, savoring the peace and beauty of the Colombia Ice-Fields Parkway, eventually the 3 cylinder Triumph motorcycles called to us, urging us to forge northward. Our stop for the night put us in Grand Cache, Alberta. My arrival was signaled by the Triumph coughing to a stop, meters short of the gas pumps, only a few minutes before closing time. During the last 20 kilometers of our ride I had been drafting Neale, only a few feet behind, saving fuel. I would not have made it without that racing technique, and the excitement of drafting for that long had my hands shaking as I fueled the thirsty Triumph Tiger 800EX. Although we were exhausted, the lesson for the day was not to pass a fuel stop, especially since we were heading onto more isolated stretches of road beyond Dawson Creek, BC, the official start of the Alaskan Highway. The rain that had followed us subsided, it was nice to be bathed in warm sunshine as we rode by the stunning landscapes of north eastern British Colombia. The Triumph adventure motorcycles made perfect mileage munchers with smooth powerful engines, suspension capable of smoothing out even the roughest road imperfections, a good riding positions and comfortable seats. Soon we noticed there was less road traffic, and much more wildlife, with deer, moose, buffalo and black bears so frequent that my desire to stop and take photographs waned. We needed to make up some time and kilometers to get to the Arctic Circle, so the trip north would have few stops. The trip back would be at a slightly more sedate pace to enjoy the splendor along the Alaska Highway. The highway past Fort Nelson had very few stops, the remnants of many abandoned hotels, houses and gas stations lining the Alaskan Highway, all evidence of the harsh life. 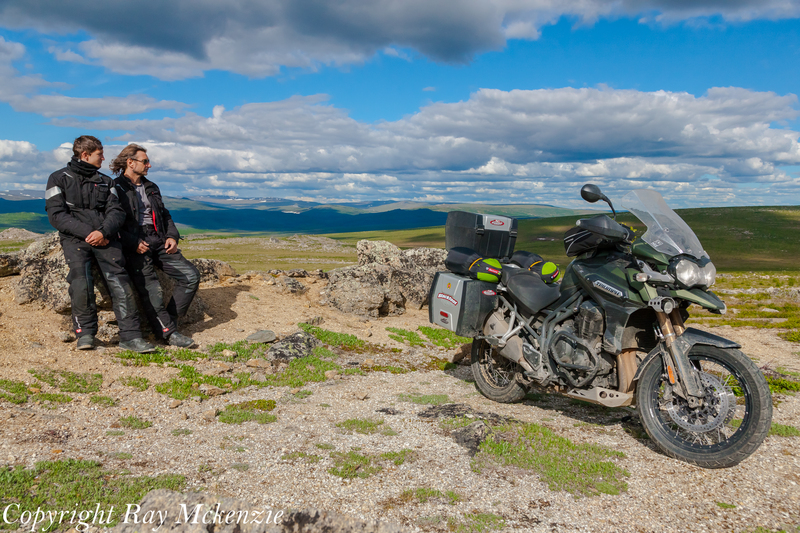 We made sure that we stopped for fuel where ever we could to ensure we would not repeat the run to Grand Cache. The fuel stops allowed us to enjoy the stories from shop/gas station owners who told us of hard times, fewer travelers, and higher operation costs with many of the active stations running diesel generators to provide life giving electricity. No doubt adding to the already high cost of fuel and incidentals, certainly a tough life for any small business owner. The conversations at each of our stops fueled my thought process, causing me to wonder what life would be like with no electricity, no internet, no cell phone coverage, back to simpler times when conversation meant sitting down with the person and actually looking at them when you talked. I embraced being unplugged from the electronic world during the day, and that made my experience on the ride incredibly engaging, not only with Neale and Patrick, but with others we met along the way. 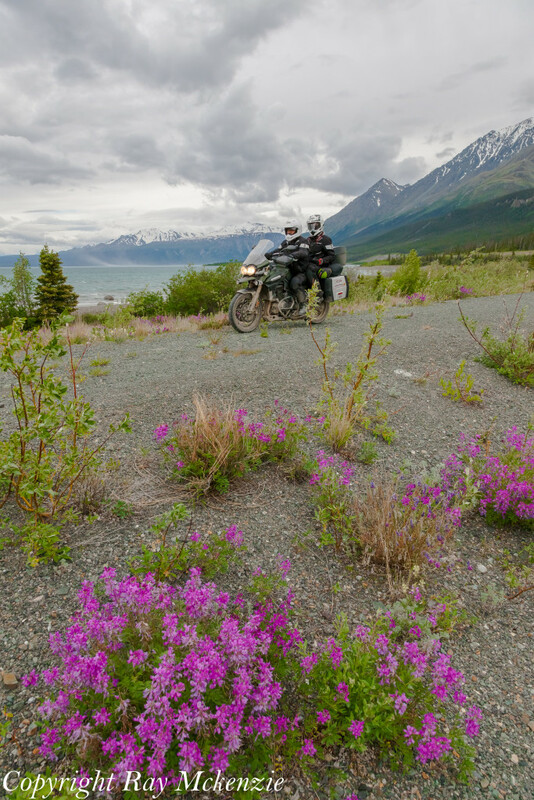 It was at Kluane Lake that I truly became totally immersed in the ride, the smell of wild flowers, pine trees, air free of pollution, all freeing my mind to the essence of the “wild” Alaska Highway. 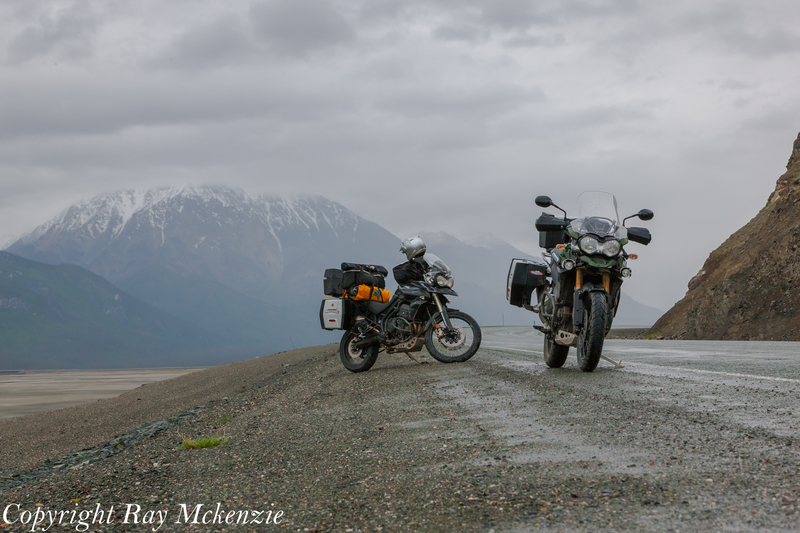 We found ourselves stopping at the southern part of Kluane Lake, which was being drenched by rain, despite our plan to ride hard north we could not ignore the beauty of the place. There was no traffic what so ever and the area screamed, “You’re in the wild now!” complete with Grizzly Bear tracks along the muddy shores. 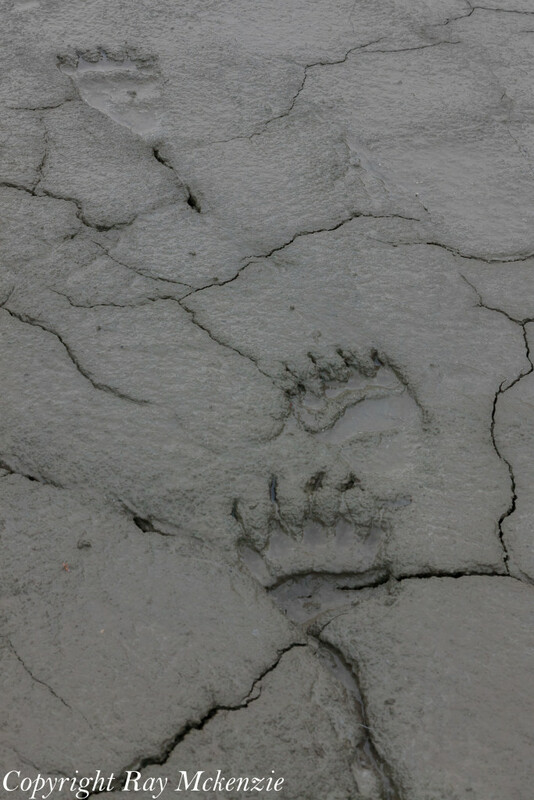 I ventured down the steep banks to examine the fresh tracks and scanned the area to make sure I would not disturb any wildlife, or stumble across the Grizzly who made the tracks. It was in that moment I knew I was no longer in man’s realm, animals and Mother Nature ruled the land here, and either could surprise you at any moment. I felt a huge weight lift from my shoulders as I climbed up the bank to the waiting Triumph. Despite being surrounded by angry skies, and heavy rain, the mountains and the incredibly clear water of Kluane Lake made it feel as if nature had reached out to me. The desire for material things was gone and replaced with the grateful realization that life is about experiences, like that very moment. I needed to truly absorb the amazing things around me each day, things that I would generally take for granted as I still had an addiction to the electronic world, waiting for the next text, Facebook like, or Tweet. As I thumbed the starter button of the Triumph I knew that nature had helped me see that I needed balance and, as I pulled back onto the Alaskan Highway, I wanted that balance in my daily life. Nature’s message was hammered home when we reached Destruction Bay. The skies had opened up again, with rays of sunshine beaming down on nearby mountains and turning the lake an amazing turquoise blue that has to be seen to be appreciated. During our lunch stop overlooking this incredible vista, both Neale and I were amazed at the 6 travelers next to us, clearly completely addicted to the electronic world, heads down in their hand held devices, not talking to each other, not looking at the amazing landscape right in front of them, trapped in their addiction to the next message, tweet, or Facebook like. I watched them and at each glance the scene was the same, no talking, just complete attention to the little screen device. Nature was letting me know that I needed to address my own addiction to the electronic life. Was I living as experientially as I could? Was I addicted to material things as well? Was I disengaged with my friends and family as a result? I vowed that I would make changes and try to live a life not bound by an invisible connection, but by the connection with what was actually in front of me, whatever that might be. Soon we were on our way, with the Alaskan Border our next stop, a first for Patrick and I, but Neale had been here many years ago on his old Honda. I wondered, as we took the typical welcome to Alaska sign tourist shots, what did this area look like 20+ years ago? Neale’s ride back then must have been epic! 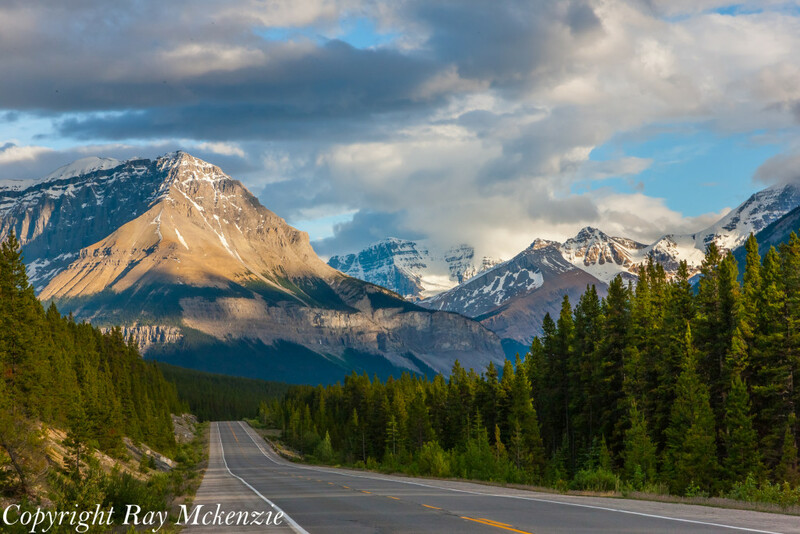 The long stretches of no traffic or signs of man other than the Alaskan Highway itself indicated a level of raw wild you just cannot find in the Southern areas of North America. It was easy for me to understand why Alaska calls out to so many who want to experience adventure, as well as nature. Dawn woke us only a few short hours later with daylight shining through the curtains as our alarm. After a hearty breakfast we were off to Fairbanks, Alaska. 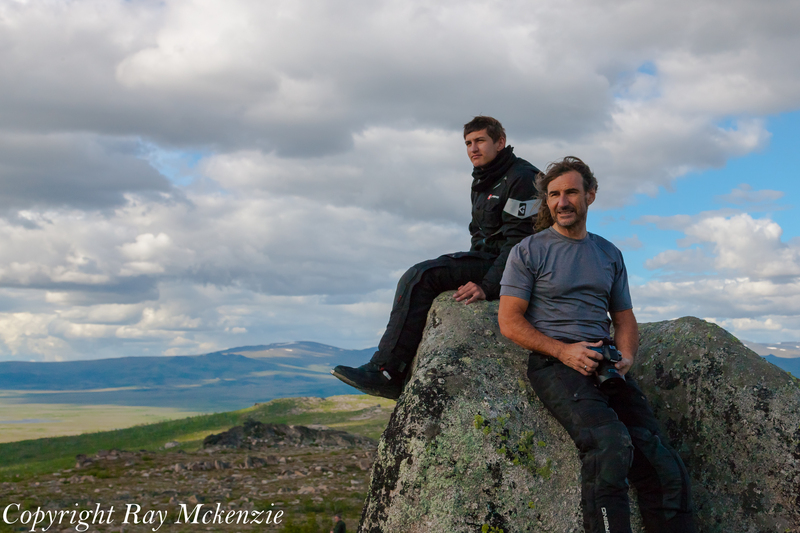 The rain was heavy as we headed northwest, Neale and Patrick comfortable in their waterproof Gerbring heated suits. I have to admit I was a bit jealous as I was soaking wet and shivering due to a failure in my own riding gear. The further north we went the more the temperature dropped, eventually settling at 4 degrees Celsius. Despite riding through sheets of rain, I was beyond excited to reach Fairbanks, literally the gateway to our final push north to the Arctic Circle. I stood on the foot-pegs of the Triumph as we pulled into town, fist pumping the rainy sky while howling like a wolf in my helmet. We picked up Nemo camping gear, which had been shipped to the local BMW dealer for us, and then retired to the hotel for a hot tub, dinner and some much needed rest as the rain slowly dissipated. 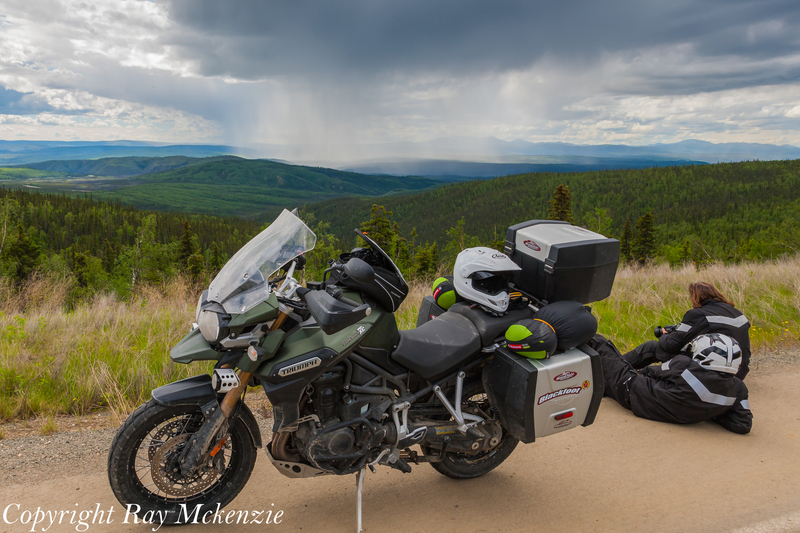 With the acrid smell of drying motorcycle gear wafting throughout the room and creating sauna type humidity, I eased off into dreamland, riding the stalwart Triumph Tiger 800EX in Dakar like fashion north on the Dalton Highway…aaaahhh I love my dreams! The next morning we met “George,” the fellow Neale had sold his old Honda 550 Four too all those years ago. 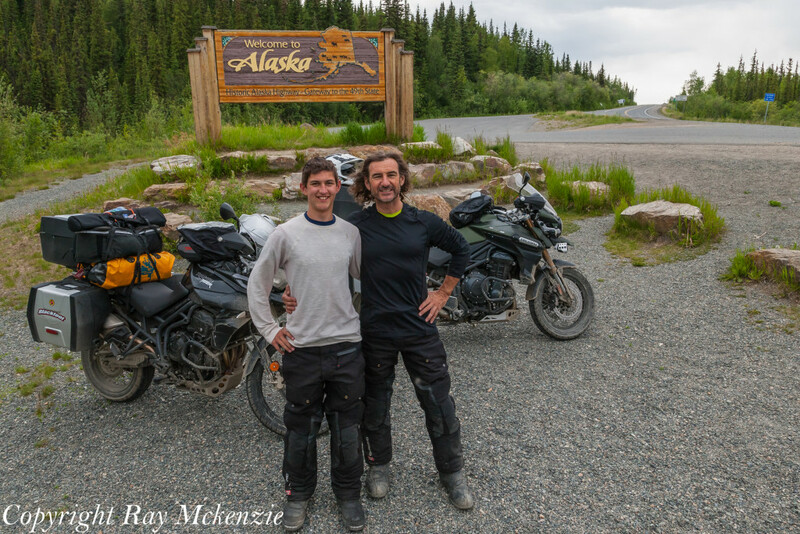 The bike now long gone, a faded memory, but a thread which bonded Neale and George as they reminisced about the motorcycle, life, and wild Alaska. Time, ever the enemy, forced us to leave the warmth of the coffee shop. With a wave we left the parking lot heading north to the Dalton Highway. Although Neale, Patrick and I would only be 3 of the hundreds, perhaps thousands of riders to traverse the Dalton this year, for me it was significant moment for me and something I had wanted to do for years. 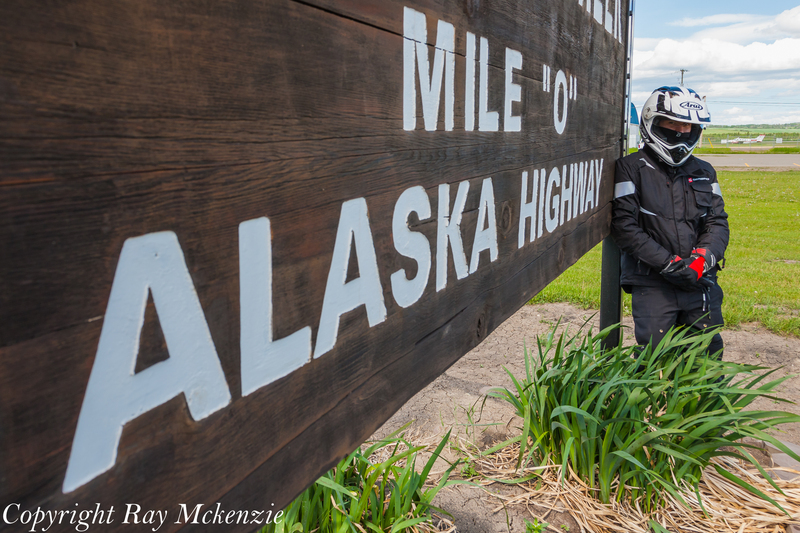 The instant I saw the sign which announced the beginning of the Dalton Highway, known as the “Haul Road” to locals, I was overtly thrilled, again letting out a wolf howl which I am sure Neale and Patrick could hear over the sound of the Triumph’s exhaust. A photograph or two later and we were northbound on the “Haul Road”, a rough, muddy, rocky, dirt trucking road which links Prudhoe Bay to Fairbanks. The road can be very unforgiving due to drastic weather, elevation surface changes combined with large trucks travelling at high speeds. The first haul truck I saw did not slow down at all, easily thundering along at 70 miles per hour, throwing up rocks, and leaving us riding through a huge cloud of dust. My Haul Road lesson, always shift as far to the right as possible to avoid becoming a rock catcher for big trucks. Note to self the haul road has frequent pop quizzes on this topic! As we ventured further north I was captivated by blue sky dotted with clouds so perfect they looked like they were painted just for me. I had not seen sky like that before or since. 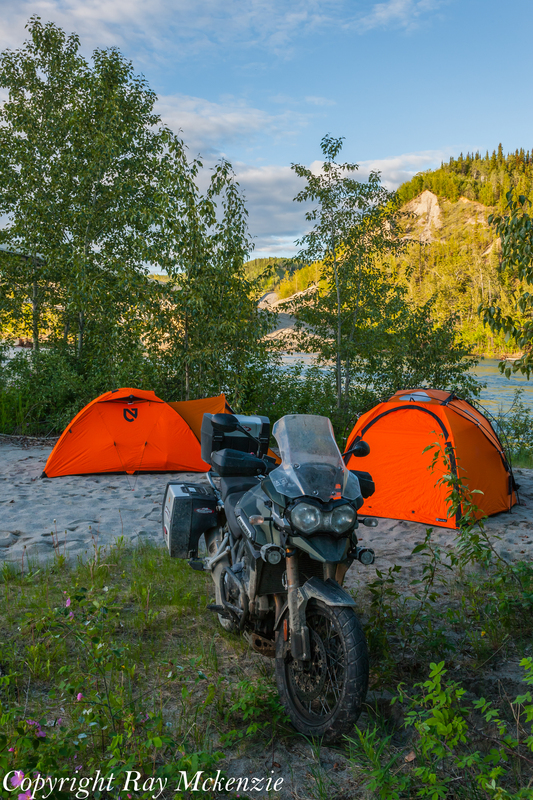 The stunning weather stayed with us all the way to the bridge over the Yukon River and the Yukon River Camp Restaurant on the north side of the rive where we stopped for lunch, fuel, and to grab a few photographs. In our exploration of the area we found a very large tugboat rusting away high and dry on the shores of the mighty Yukon, leaving us with unanswered questions about how and why it got there. As we walked along the banks of the Yukon River, I could tell Neale was getting excited about the next segment of our adventure, giving us a clear reason to pack up and push north. 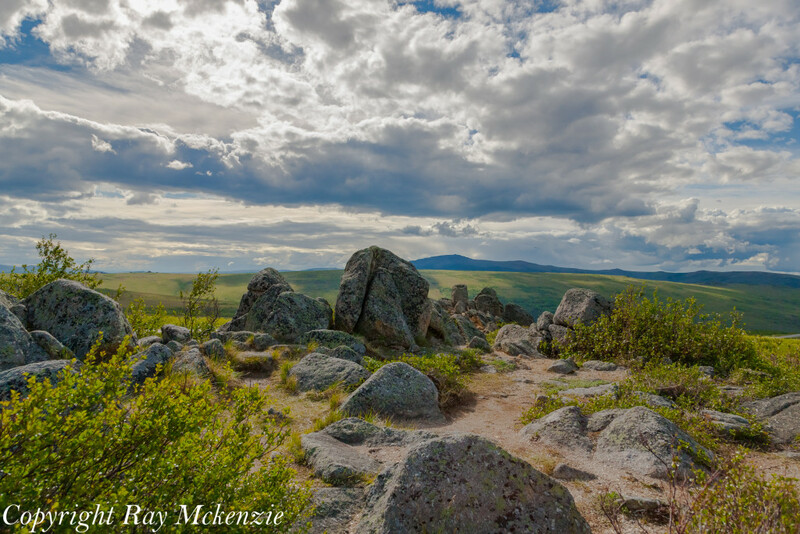 I knew we did not have too far to travel to reach the Arctic Circle when we reached an expanse of uber rugged terrain, the Finger Mountain Rock Formations. Neale suddenly motioned for us to stop, we had reached the very location where Neale had abandoned his journey North many years ago. 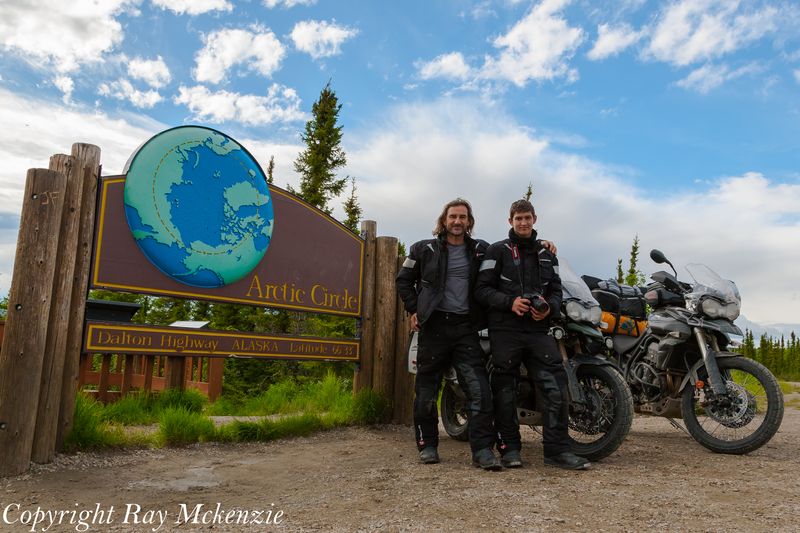 We explored the area, set up the motorcycles for some photos, and chatted about Neale finally achieving his goal of reaching the Arctic Circle. As Neale walked through the rugged terrain, I could tell that the place had significant meaning for him, as he became unusually quiet and introverted, yet he made sure that he shared moments with Patrick. True father and son bonding north of the 60th parallel. As we prepared to leave, we all realized that for the first time in the adventure the road ahead was new for us all, and the thrill of making the Arctic Circle empowered each of us to push on. Little did we know that the Arctic Circle was only 17.2 miles further north, Neale had been just minutes away from his goal when he had turned the Honda 550 around years ago! Now we had finally achieved that goal, more than just a line on the map, it was the the ride to get there, and to share it with Patrick and I. We took the standard Arctic Circle Sign photos, and I could see a sense of accomplishment wash over both Neale and Patrick, I was so happy to be a part of that very special moment! The moment of elation eventually gave way to the necessity of finding a place to camp for the night, and after a short drive north we found the perfect campsite along the North Fork Bonanza Creek. I laughed at how I struggled to put up the Nemo tent for the first time, not able to use the instructions which I had mistakenly left behind in Fairbanks. I found it frustratingly funny, and during my prolonged conflict with the tent I hatched a plot to surprise Neale and Patrick. With the tents up, we had a hearty meal of cheese, European wieners, and trail mix, we reveled in the sounds and feelings that only come from being beside a campfire with friends. The campfire also helped keep the clouds of mosquitos from strafing any open skin, none of us wanting to venture far from the fire even though we were covered in repellent. 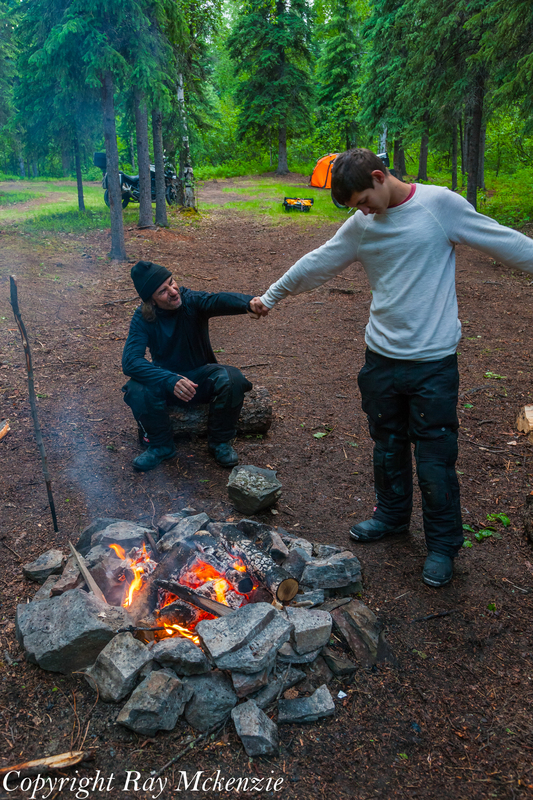 The impact of the day was evident on Neale, he was clearly ecstatic to be sitting by a campfire, north of the Arctic Circle with his son Patrick, the moment between them pure in the rawness of the experience. The sun hardly sets at all at the end of June, north of the Arctic Circle, and the sun had been up for quite some time by the time 05:30 am rolled around. I was ready to execute my plan to prank Neale and Patrick with a bear banger. The bear banger is basically a very large firecracker with a fuse that is launched from a pen like tube with a striker inside. Once fired, the large firecracker flies away about 20 meters and explodes with a very big bang that is intended to scare any bears away. I laughed quietly as I prepared the bear banger for my version of the Big Bang Theory, with Neale and Patrick part of the experiment! I pointed the bear banger at a spot about 15 feet above Neale’s tent, triggered the pen, and with a crack, the bear banger arced perfectly, exploding precisely over Neale’s tent, with an earth shattering kaboom! There was the frantic sound of zippers, many expletives, and suddenly a wild eyed Neale popped out of his tent, I could not help but laugh hysterically! I had pranked ole Neale and felt pretty damn good about it! Adventure can take many forms I guess. 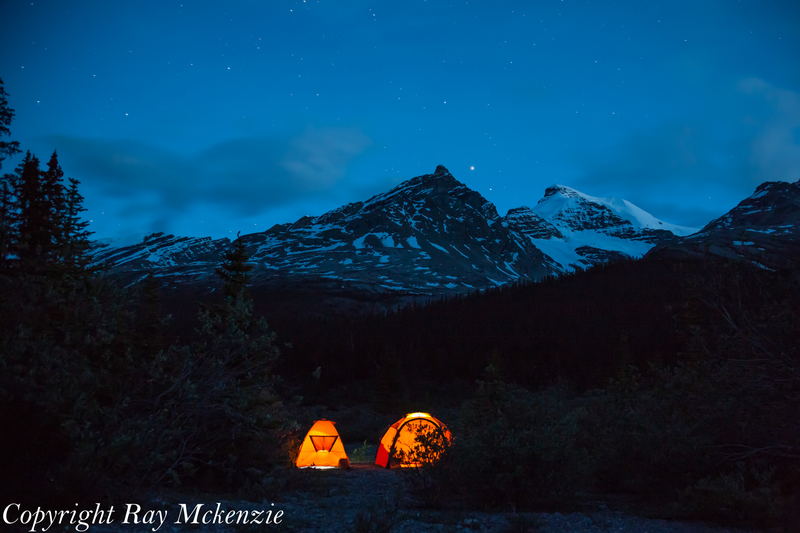 As we left our campsite, heading south I was excited as I envisioned showing Neale and Patrick some of the beautiful Canadian Rockies, mentally planning where to stop in the coming days. We rocketed south on the rough haul road, dodged scattered rain clouds, and had a blast stopping for photos ops we missed on the way up. Soon we were back at the Yukon River Motel where we stopped for fuel and lunch. After a hearty meal we went out to the motorcycles and were greeted by a couple of world adventurers, Roel from the Netherlands and Azure from California. 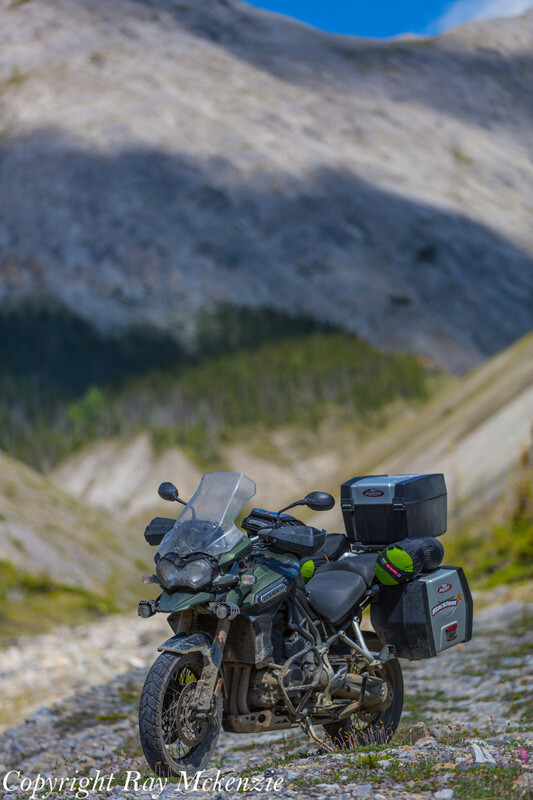 Their utilitarian Honda Transalp motorcycles equipped well enough to support their world adventure where ever it might take them. Roal’s motorcycle even had a map on the metal top case, showing where they had been. Neale was drawn to them as they shared stories of past rides and countries visited, the common theme of motorcycle travel allowing complete strangers to share stories. It never ceases to amaze me at just how a simple piece of machinery can actually bring people together, the motorcycle is such an amazing tool for opening communication, making all of us who ride ambassadors of the road. We eventually shared emails and website info with Roel and Azure (http://www.mytickettoride.com/) and we were soon back on the road south. After a brief stop in Fairbanks, we reluctantly began heading southeast, back to Tok, where we again stayed at the Golden Bear Motel, and despite it being 9pm it was as bright as noon hour! 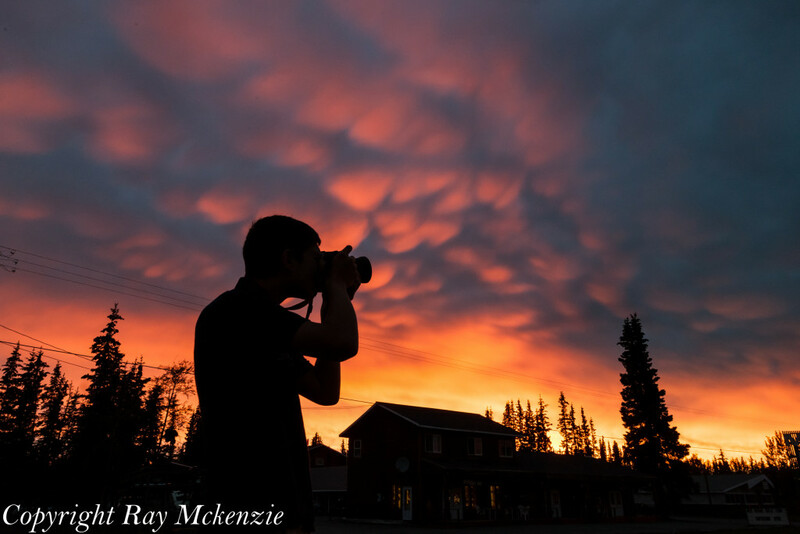 Not long after our arrival, the sun dipped low in the sky and illuminated the bottom of fabulous Mammatus cloud formations, painting them in the most incredible red, orange and yellow colors that I have seen in a while. Patrick and I were literally running around snapping photos, trying to capture the moment, and Neale eventually joined us as we enjoyed our last Alaskan sunset. 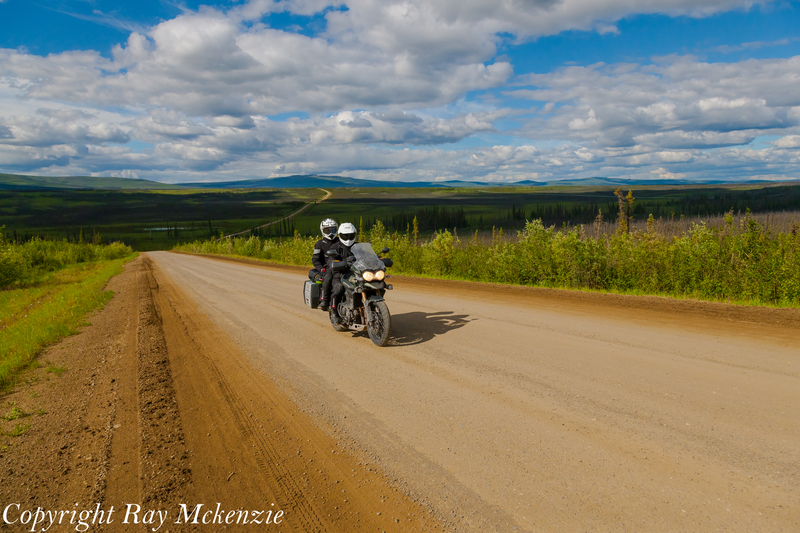 The next day we crossed back into the Yukon Territory and shortly after I noticed a big male Grizzly lumbering along in the grass along the side of the road, it barely flinched as I rode by. I motioned to Neale to turn around and I slowly returned to the area where I had seen the Grizzly Bear which was now out of sight. I turned off my motorcycle, pulled out my Canon 5D MKIII with a 70-200 L f2.8 Zoom lens and looked around for the bear with no luck. 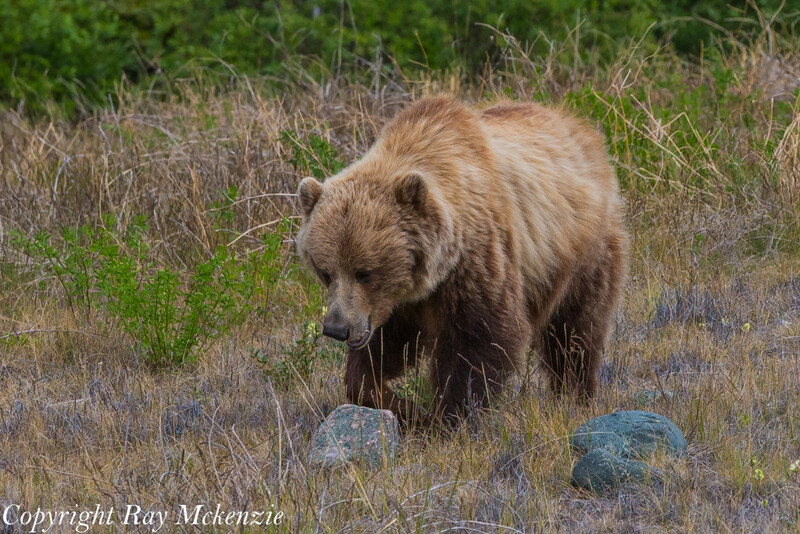 Neale pulled up beside me as I was scanned the bush for the bear when suddenly the Grizzly Bear appeared out of the deep ditch alongside the raised highway, let out a loud roar, and raised its paw as if waving at us. I did not panic but having the Grizzly so close caused me to jolt back as I squeezed the shutter on the camera, only 1 of the images would be usable. The Grizzly raised did not charge us and then slowly retreated about 60 yards from the road, grunting and snorting while staring at us. Not wanting to push the horseshoe I clearly had into an area where the sun does not shine, I slowly put my camera away, started the motorcycle and pulled away followed by Neale. We stopped down the road to chat about the encounter and laughed about our close call, but we both realized just how close we had come to being a breakfast platter for that Grizzly. Nature reminded me that life in the wild is unpredictable and I had put myself in a position too close to where the Grizzly was last seen, a mistake born out of excitement that could have been tragic. I was extremely cautious from that point forward. Whoever said you need to be off road to have an adventure, has never rode with Neale or I. You truly cannot script the stuff that happens when we ride together, and it has made for some memorable rides/moments. Our trip through Whitehorse, Watson Lake, saw us visit typical tourist destinations, which was cool, but Neale and I wanted more. With such limited time, we elected to sleep along the banks of the Hyland River, setting up camp very late in the day, the sounds of the wind and the river dominated my senses as I settled into my sleeping bag. I had one of the soundest sleeps I have had in a while, enjoying the purity of nature, and the company of my friends. In the morning we lingered for a while, absorbing what had been an amazing place to camp, none of us wanted to leave the place. 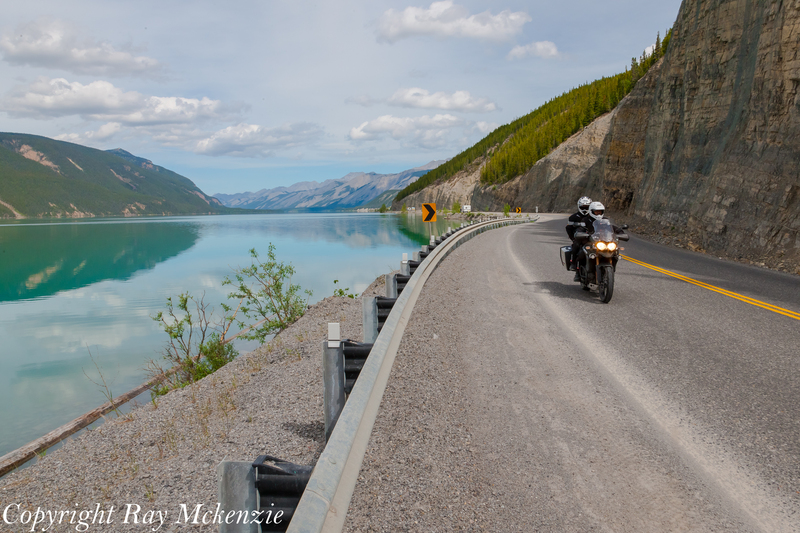 We had the highway to ourselves as we passed the jade waters of Muncho Lake, “Big Water” in the Language of the Kaska people. The inner wild child came out in Neale again as he motioned to me to stop. 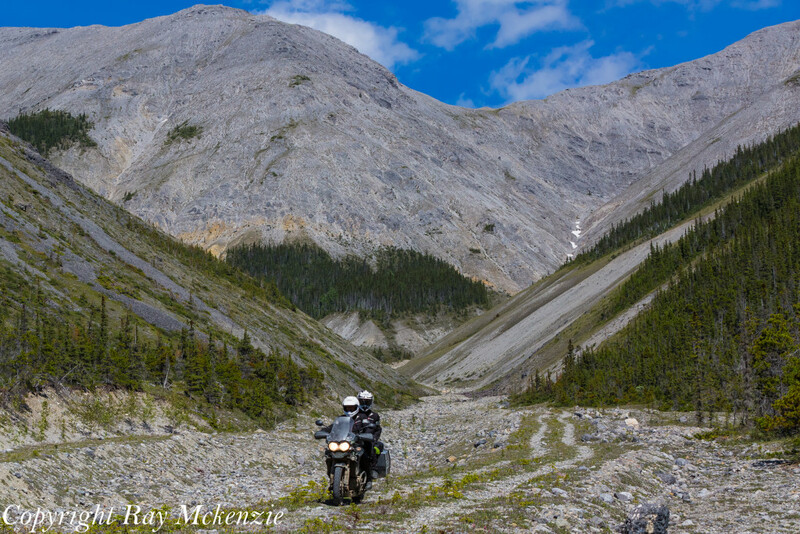 I pulled off in an area that allowed us to park the Triumph Motorcycles close to the rocky shores of Muncho Lake. Neale bounded off his motorcycle and excitedly said “Let’s go for a swim!” I had swam in glacier water before and was, therefore very familiar with how chilly it can be, so I gracefully declined. I did play along with Neale so he could have a memorable father/son moment with Patrick. Neale jumped into the ice cold water first, and exited like it was nothing, I smiled as Patrick then committed to jumping into the freezing water himself. 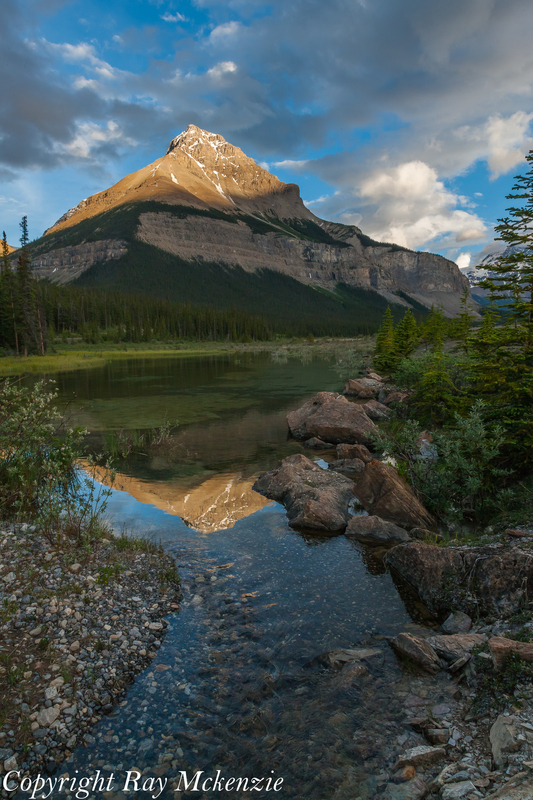 With perfect timing both Neale and Patrick jumped into Muncho Lake, instantly Patrick launched himself back out of the water like a rocket, gasping for breath, his body reacting to the piercingly cold water. Neale was not far behind, and I laughed out loud at the shear craziness of it all, taking a few photos to remember their reactions. I would bet Patrick will remember that little dip in Muncho Lake for the rest of his life! Wild eventually gave way to man as the traffic increased significantly making it harder to enjoy the scenery, and during one of our rest stops Neale told me that he wanted to explore some of the old Alaskan Highway. Less than an hour later we navigated the Triumph Adventure motorcycles along a few sections of the old highway, including a curved trestle bridge, and it was clear to me why the modern Alaskan Highway had not triggered memories for Neale, it was nothing like the old stretches of that iconic road. Sure the new highway is efficient and safer but to me there was a certain raw character in the old Alaska Highway that cannot be reproduced. I had to remind myself, “Adventure motorcycling is not what or where you ride, the adventure IS the journey itself, defined by no one other than yourself.” Riding with Neale is always an adventure regardless of the type of road or motorcycle. In Grand Prairie, Alberta, Neale was able to meet with Tina Kennedy a childhood friend of Father Geovanni (“Geo”), a Canadian Priest who had inspired Neale to form Wellspring International Outreach to help orphans in Peru and South Africa. I listened intently as Neale and Tina discussed Father Geo, the memories of “Geo” resounded in both, leaving lasting impressions which still affects both of them to this day. How serendipitous that a young Englishman travelling the world on a beat up motorcycle living the wild life in the mid-1980s, meets Canadian Priest who was also riding a motorcycle. That chance meeting causes a change in life perspective for the young Englishman who ultimately forms a charity for orphaned children, and produces a TV program combining adventure motorcycle riding with philanthropy. You can hear the passion from Neale and Tina as they reminisced about Father Geo, and that passion had them chatting into the wee hours of the morning. Only a few hours later Tina joined us for breakfast at Tim Hortons, a coffee shop extraordinaire, complete with its delicious dark roast coffee and breakfast wraps that scream good morning to your taste buds! The conversation continued from where it had left off the previous evening, remembering Father Geo and the chat left all of us with a desire to stay and chat. Time stops for no one and in this case the road was calling with Jasper only a short ride away. We made it there in time for a quick lunch with the Canadian Rocky Mountains as our backdrop and enjoyed watching tourists ogle nick knacks from local vendors. 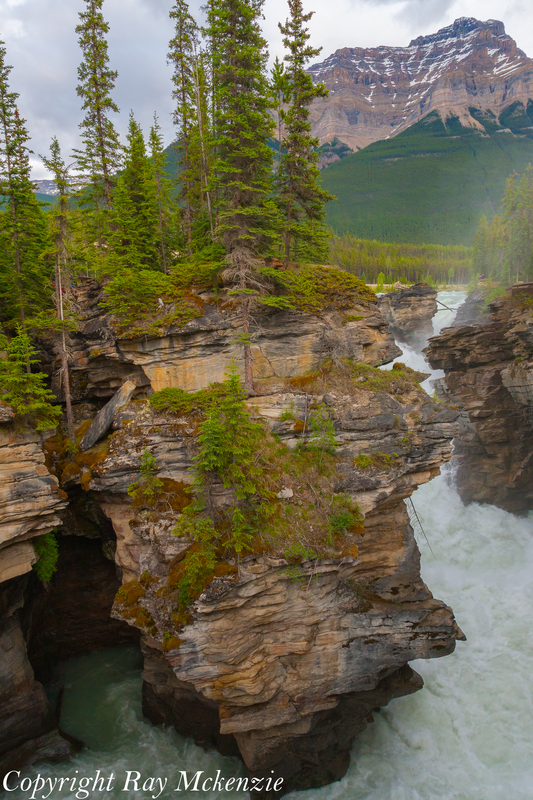 As we left Jasper I was determined to help Neale and Patrick experience a few icons of our beautiful country, and Athabasca Falls, was certainly worth a visit. We took our time to explore the nearby canyons and thundering waterfalls, and as Neale and Patrick posed together for a tourist shot, I could see that they were both very much engaged in the moment, surrounded by the power of nature, a father and his son. 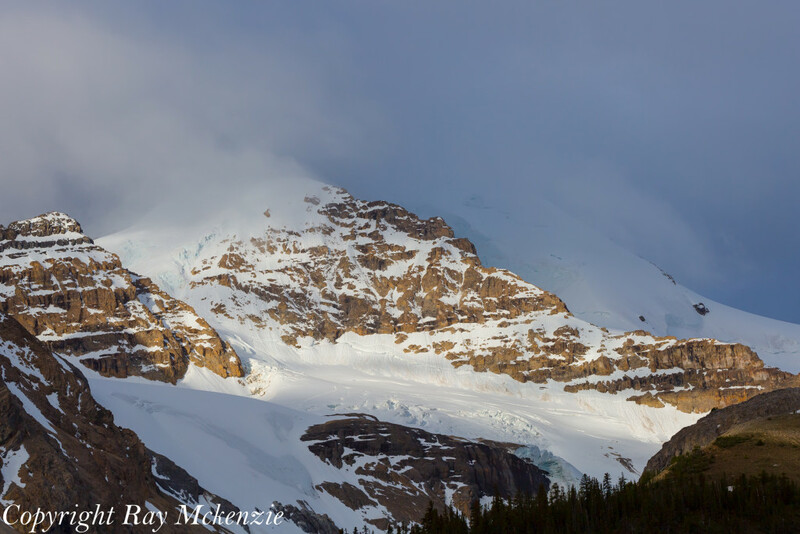 Later in the day, as we traveled south along Colombia Icefields Parkway, Neale saw a very steep rocky dual path heading up a valley between two mountains. I pulled over and asked if he wanted to go and check it out, which of course he did, taking the lead as we rode up the path. The Triumph 1200 was spitting rocks off the rear tire as Neale searched for traction, suspension working hard to absorb the jolts from the uneven surface. I followed behind, mindful of Neale’s trip to South Africa with Anthony Carrino where the hill climb they did along the Swaziland Border almost resulted in a big crash. I did not want to push the envelope on the 2014 Triumph 800 and as if the machine sensed my inner thoughts, the rear wheel stopped giving me forward motion, digging a nice deep scallop into the loose rocks. I did not push it farther, and watched as Neale rode higher and higher. He only stopped when he saw me stopped below, I am sure he would have went as far as that road could go, but I held him back! The location was perfect for the photographer in us all and we took full advantage of the mountain backdrop, taking some amazing photos with the Triumph Adventure motorcycles posing in their natural habitat. The clouds began to close in, very late in the day, and we began our search for a campsite near the Colombia Icefields. The setting sun had us stop to photograph the stunning show as the light and shadows played along the faces of the mountains before us. Breathtaking does not adequately describe the beauty, and we did our best to capture the moment. We had lingered a little too long during the sunset, and every campsite in the area was now full, even the hotel at the bottom of the Colombia Glacier was full. Our only option left was to stealth camp as it was too late in the evening to continue riding, and within minutes we had our camp setup. With such an incredible backdrop, I wanted some night photographs and as the clouds drifted away they revealed a star filled sky above our mountain enclosed valley, it was the perfect last night of our adventure. With a bear banger resting nearby I drifted off to sleep, smiling at the thought of waking Neale and Patrick with another bang! I awakened well before sun up and decided to walk around the area to see what surprises nature had for me. The mountain tops were partially covered by fast moving clouds, a perfect scene for me to enjoy as I sat on some rocks, snapping a few photographs to remember the moment. Soon the sun began to show itself which meant I had to awaken my English friend, and I was very pleased as the bear banger arced perfectly over Neale and Patrick’s tent, exploding with a nice loud Kaboom, leaving echoes and laughter throughout the valley. Neale wanted a day of rest before his flight home so we decided to head back to Calgary, via Moraine Lake, and Banff. 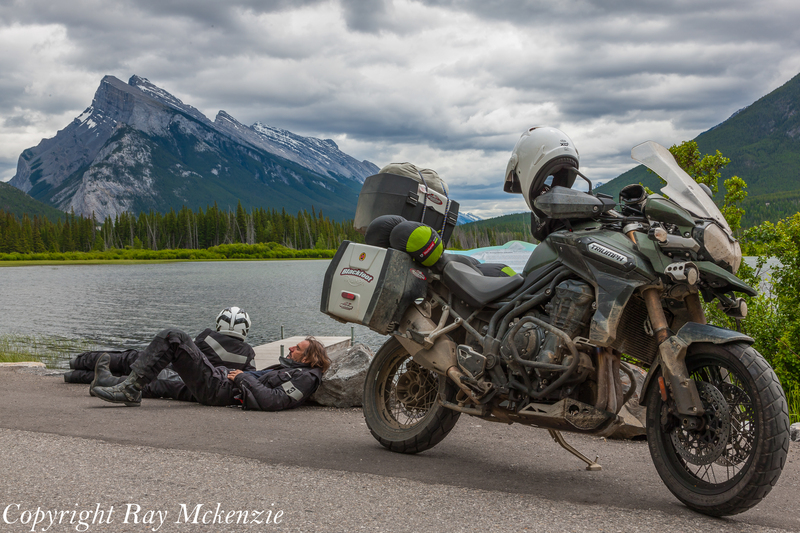 The long days in the saddle had us all wanting a bit of a rest, and we found a nice spot to chill by Vermillion Lakes with a perfect view of Banff and Mount Rundle in the background. I wanted more time, I did not want the adventure to end, wishing silently for a means to continue the journey. As I enjoyed the stunning mountain views with my friend, I reflected on what I had done in my life and recognized the precious nature of time. The realization was the result of the things I had seen that cannot be unseen, friends lost in the line of duty, and those I know who had passed on without the opportunities I have had. In my humble opinion, I believe that THE most important commodity in a person’s life is time. Time cannot be changed, you cannot go back in time, you cannot get more of it regardless of stature, you cannot negotiate with it, you do not know how much time you have, and when you’re in your final moments you will be wishing for more of it. 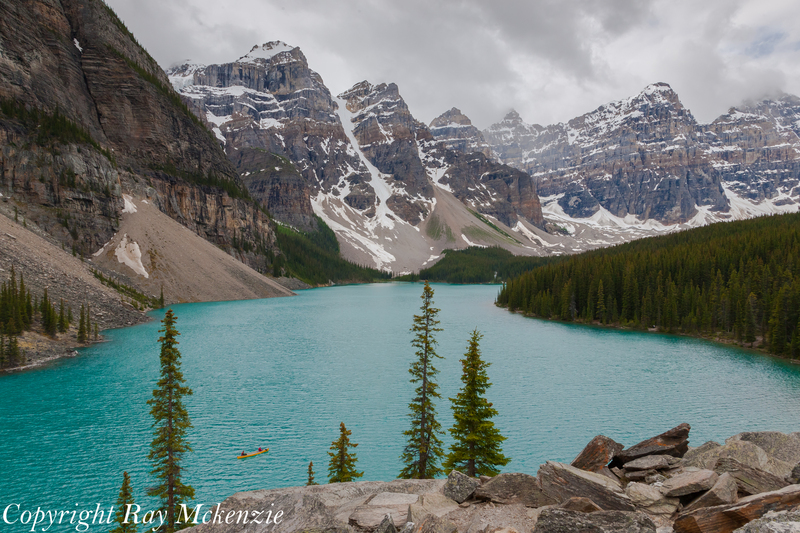 I was wishing for more time for many, many things at that particular moment in Banff, but with my friend and his son spending quality time together I could not help but feel happy for them both. 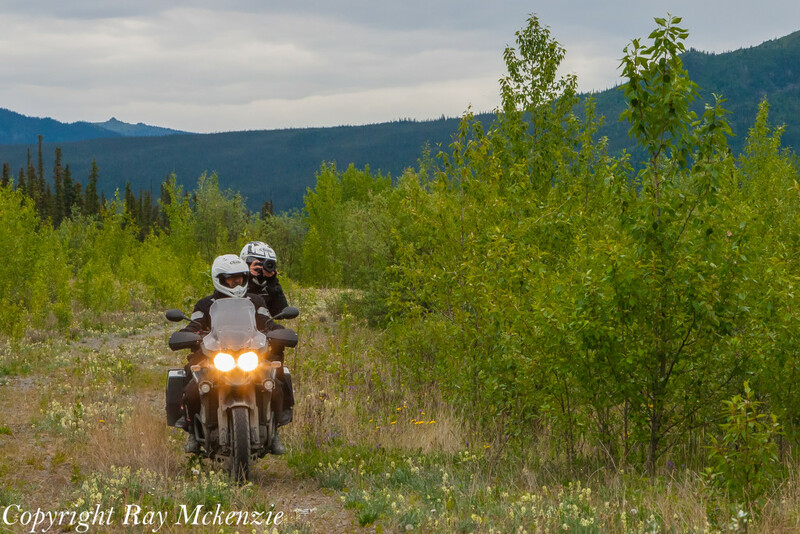 As we returned the incredible Triumph Adventure Motorcycles to Blackfoot Motosports I wanted more. More time, more motorcycle, more nature, more adventure, more moments with my sons. 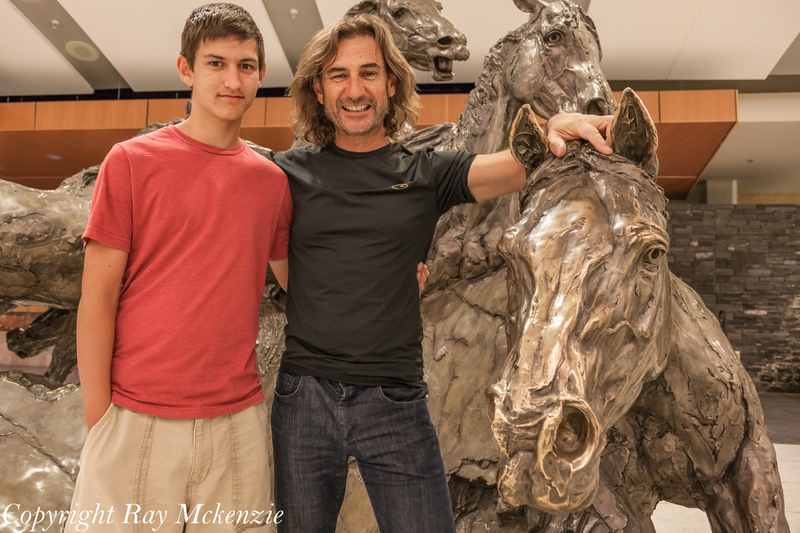 I bid my friend and his son goodbye, and I knew that I needed to make changes in my life to truly embrace experiential living, to reverse my trend of gathering “stuff.” The trip, now a distant memory, was not just a motorcycle adventure with my friend and his son to Alaska, but one which helped me discover the meaning of living in the moment. I have made many changes in my life since the Alaska Adventure with Neale, and I am focused on being engaged in each moment and experience. I will not worry about time because I am grateful for the gift of the next moment, not for what was or what might be, the gift that each precious moment is what I have. In the end that is all I need. 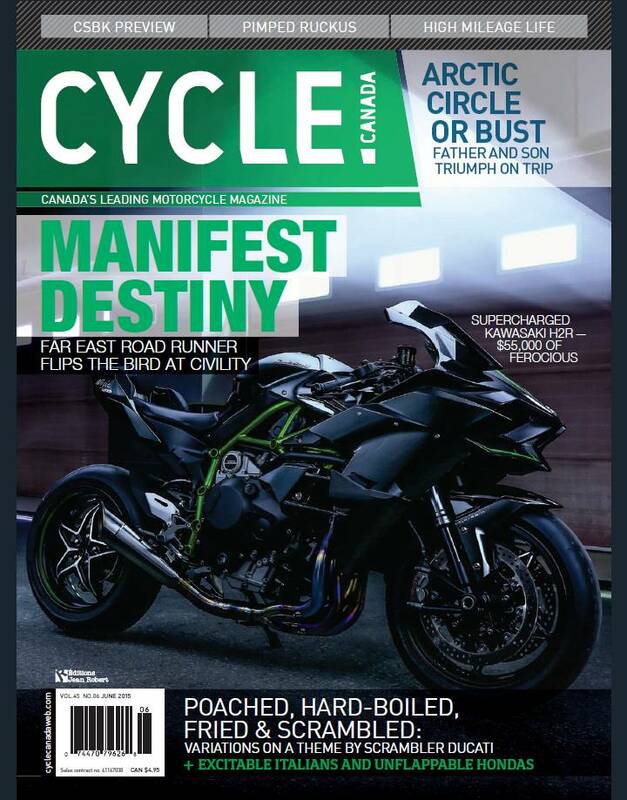 See the June 2015 Issue of Cycle Canada Magazine for Neale’s words on the adventure!!! 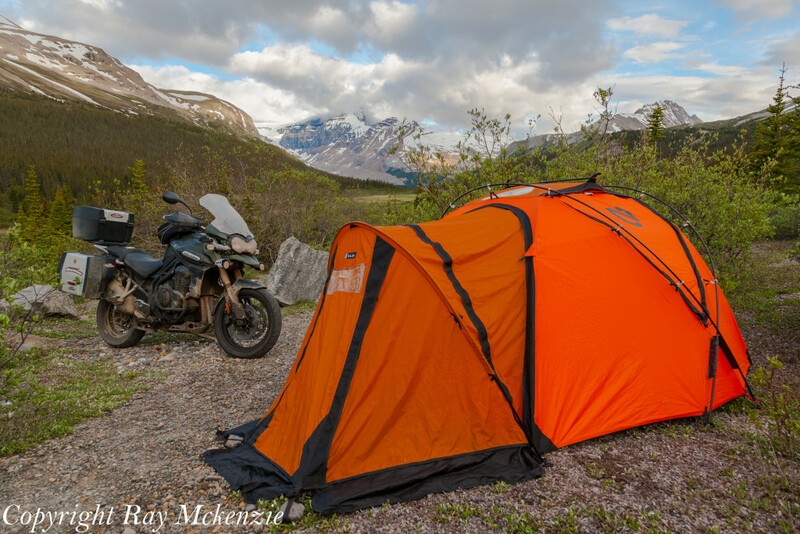 ← Neale Bayly Rides – Adventure Pit Stop for me! Nice words and beautiful photos. I’m glad you had this opportunity and are enjoying life. I known you’ve been through some hard times. Life is short. Good to see you making it count.